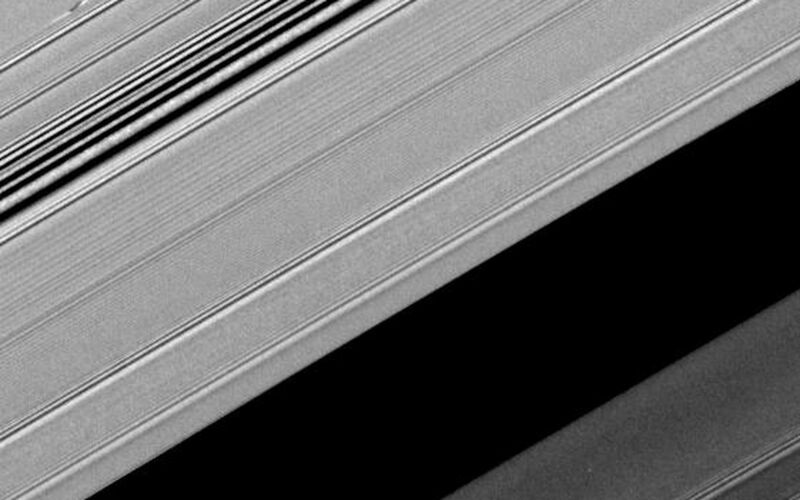 A propeller-shaped structure created by an unseen moon appears dark in this image obtained by NASA's Cassini spacecraft of the unilluminated side of Saturn's rings. The propeller is marked with a red arrow in the top left of the annotated version of the image. The Encke Gap of Saturn's A ring is in the lower right of the image. The A ring is the outermost of Saturn's main rings. The moon, likely about a kilometer (half a mile) across, can't be seen at this resolution. However, it is larger than other "propeller" moons and has cleared ring material from the bright (because they are less opaque) wing-like regions to its left and right in this image. Disturbed ring material close to the moon blocks more sunlight and appears like a dark airplane propeller. 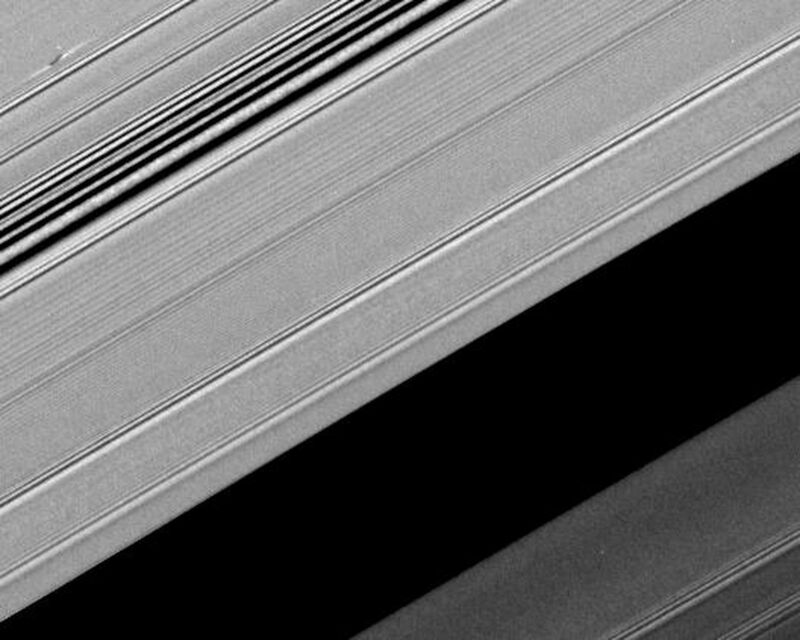 Several density waves are visible in the ring, particularly in the upper left. A spiral density wave is a spiral-shaped accumulation of particles that tightly winds many times around the planet. It is the result of gravitational tugs by individual moons whose orbits are in resonance with the particles' orbits at a specific distance from Saturn. A propeller's appearance changes with viewing geometry, and this image shows the way a propeller looks when viewed from the unilluminated side of the rings. 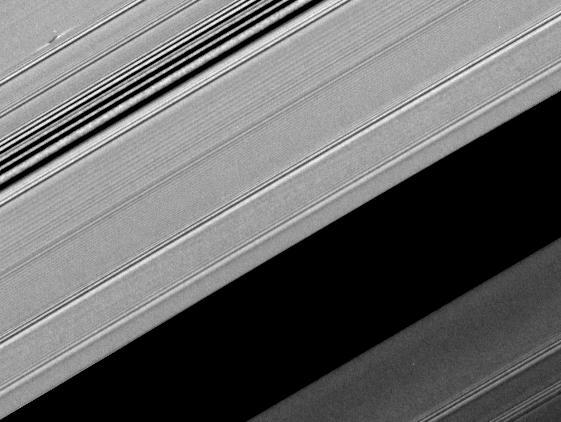 The dark structure at the center of this propeller corresponds to the bright structure seen in PIA12790, which was imaged from the sunlit side of the rings. This image is part of a growing catalogue of "propeller" moons that, despite being too small to be seen, enhance their visibility by creating larger disturbances in the surrounding fabric of Saturn's rings. Cassini scientists now have tracked several of these individual propeller moons embedded in Saturn's disk over several years. Imaging scientists nicknamed the propeller shown here "Santos-Dumont" after the early Brazilian-French aviator Alberto Santos-Dumont. The propeller structure is 5 kilometers (3 miles) in the radial dimension (the dimension moving outward from Saturn which is far out of frame to the lower right of this image). It is 65 kilometers (40 miles) in the azimuthal (longitudinal) dimension. See PIA07791 and PIA07792 to learn more about propeller shapes and to see smaller propellers. PIA11672 shows the giant propeller "Earhart," named after the aviatrix Amelia Earhart. Scale in the original image was about 2 kilometers (1 mile) per pixel. The image has been rotated and contrast-enhanced to aid visibility. The cropped inset of the propeller included here was magnified by a factor of four. This view looks toward the northern, unilluminated side of the rings from about 45 degrees above the ring plane. The image was taken in visible light with the Cassini spacecraft narrow-angle camera on Aug. 19, 2008. The view was acquired at a distance of approximately 310,000 kilometers (193,000 miles) from Saturn and at a sun-Saturn-spacecraft, or phase, angle of 121 degrees.